On Tuesday, November 14 at approximately 11:30 a.m., Cpl. Chad Booth and Sgt. Allen Desormeaux with the Combined Anti-Drug Task Force (C.A.T.Team) conducted a traffic stop on a 2017 pickup truck eastbound on Interstate 10 near mile marker 14 for a traffic violation. The driver of the truck was Stephane Baril, a native of Quebec, Canada. During the course of the traffic stop Cpl. Booth observed Baril to be overly nervous and act in a suspicious manner. Cpl. Chad Booth issued Baril a notice of violation for the traffic offense. Based on the observations made by Cpl. Booth during the course of the traffic stop concerning the overly nervous and suspicious actions of Baril, he requested permission to conduct a search of the truck. Baril granted the request, providing Cpl. Booth with written consent and allowing him to conduct a search of the truck. During the search, Cpl. Booth and Sgt. 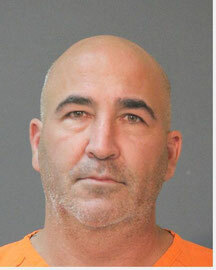 Desormeaux recovered approximately eighty (80) large bundles of compressed powder cocaine totaling 219.5 pounds, with the estimated street value of over $3,000,000.. 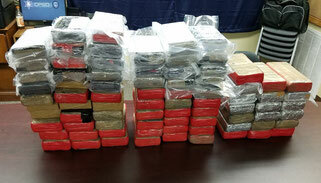 The eighty (80) bundles of compressed cocaine were found to be concealed in multiple luggage bags located in the bed of the truck. Baril was arrested and booked into the Calcasieu Parish Correctional Center and charged with possession of CDS II (Cocaine) over 400 grams. Judge Clayton Davis set his bond at $1 million.